Three changes for Jim Gavin’s side for Sunday’s table-topping clash in Croke Park against Kildare. 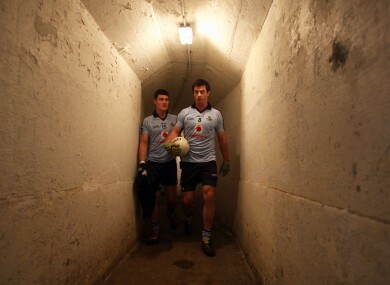 Diarmuid Connolly and Michael Darragh MacAuley will start for the Dubs on Sunday. JIM GAVIN HAS unveiled his Dublin team to face Kildare on Sunday in Croke Park. Captain Stephen Cluxton is not named in the goal for the clash with the Lilywhites while suspension rules out Ger Brennan at centre-back after he was sent-off last week against Mayo. Injury rules out Tomas Brady with a hamstring problem ruling out the Na Fianna man for the next few weeks. Gavin has drafted St Brigid’s Shane Supple into goal for his first start in Division 1 of the Allianz Football League this year. Michael Darragh MacAuley comes into the team at midfield where he will partner club colleague Declan O’Mahony as Cian O’Sullivan moves back to fill the number six jersey. Finally in attack Diarmuid Connolly is selected at full-forward due to Brady being unable to start. Wing-back Jack McCaffrey and centre-forward Ciaran Kilkenny will be hoping to bounce back from the disappointment of the county U21 side’s Leinster championship exit at the hands of Longford in Parnell Park on Wednesday night. DUBLIN: Shane Supple (St Brigid’s); Kevin O’Brien (Naomh Mearnóg), Rory O’Carroll (Kilmacud Crokes), Johnny Cooper (Na Fianna); Darren Daly (Fingal Ravens), Cian O’Sullivan (Kilmacud Crokes), Jack McCaffrey (Clontarf); Declan O’Mahony (Ballyboden St Enda’s), Michael Dara MacAuley (Ballyboden St Enda’s); Paul Flynn (Fingallians), Ciaran Kilkenny (Castleknock), Ciaran Reddin (St Maur’s); Paddy Andrews (St Brigid’s), Diarmuid Connolly (St Vincent’s), Bernard Brogan (St Oliver Plunkett’s-Eoghan Ruadh). Email “Connolly, MacAuley and Supple named in Dublin team”. Feedback on “Connolly, MacAuley and Supple named in Dublin team”.